NCF/USA is a member country of Nurses Christian Fellowship International and supports NCFI’s efforts to advance Christian nursing across the world. Will you join us in providing ongoing support for the work and ministry of NCFI? NCFI needs our prayers, special gifts, time and financial resources to continue the work that began over 50 years ago. To provide financial support for NCFI, make donations at http://ncfi.org. Your donations will be receipted and fully deductible for U.S. tax purposes. Join us in praying for NCFI at NCFI prayer guides. Journal of Christian Nursing is a peer-reviewed, quarterly, professional journal helping nurses integrate issues of faith with nursing practice since 1984. 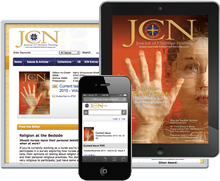 JCN International Online-Access is for individual nurses (not institutions) not living in the USA, and it offers access to all archives and features of www.journalofchristiannursing.com in English.